Come Drought, Rain, Hurricane . . . or Strike? Let’s Go Have Some Fun. . . Cheers! Here’s to Long Life! Retreat! Retreat! But Don’t Surrender. When my sister visits, she comes bearing gifts of girly raiment. When my mother visits, more often than not, she comes bearing gifts of nuts and herbs: almonds, pistachios, sage, rosemary and such di like. In my lifetime, I’ve been the recipient of fever grass, moringa, house plants, mangoes, pears (avocado), guineps, ackee, ground provision, et cetera, from co-workers, gardeners, landlords, aunts, uncles, cousins, other relatives and friends. For those of us raised in JA, especially in the rural regions, you know how it goes. It’s a practice learned from parents and grandparents—the giving of natural gifts from thy household. I’m sure you can recall the days when Mama would usher you through the gate with a weighty crocus bag for Ms. Florie down di road. And Ms. Florie would send plenty “howdy do” along with a freshly cut piece of croton, mint leaf, sinkle bible (aloe vera) or whatever she believed your grandmother loved from her “roses” garden. She’d wrap it up in a scandal bag or old newspaper with instructions for you not to drop it or “loss” it and to go straight home and walk good. 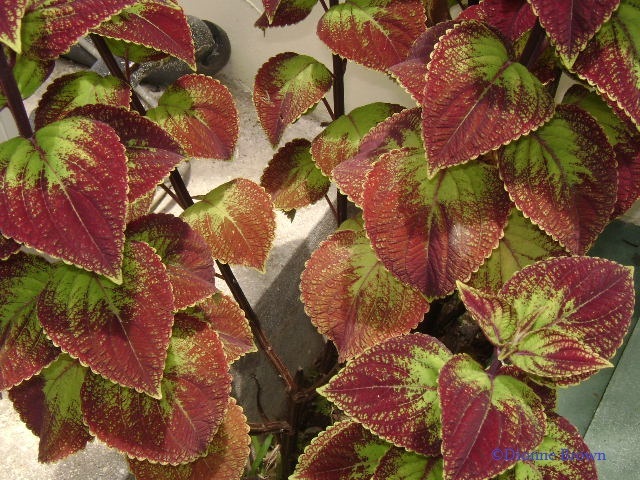 A gorgeous coleus plant, a.k.a. poor man’s croton. Back in the day, I was either elated or deflated when my mother received these natural gifts. I didn’t mind inedible plants for the flower pots. Common mangoes, plums and sweet fruit on a whole were also fine by me. Anything resembling bush, however, intimated that a cupful of not-so-sweet medicine was in my immediate future. As far as I can remember, our garden only had inedible plants, which received a steady diet of water and loving affirmations from our mother, much to our amusement. Her philodendrons, birds of paradise, spathiphyllum and dieffenbachia got more baby-talk than we did. And I’m sure she’ll tell you they were therapeutic for her nerves. Whenever our home went from rosy scents to a nauseous-green, non-house-plant smell and our mother’s countenance shifted from airy to tight-lipped and poker-faced, my trepidation began because it meant she had acquired one of those “gifts”, which would soon have us in a hostage position at the dining-room table. The smell of sinkle bible juice usually marked the official close of summer-holiday frolicking and the unveiling of an inescapable back-to-school “wash out” in short order—you know, to rid your body of the basins of common mangoes, plums (and worms) you ingested for weeks on end with your craven, naive self. 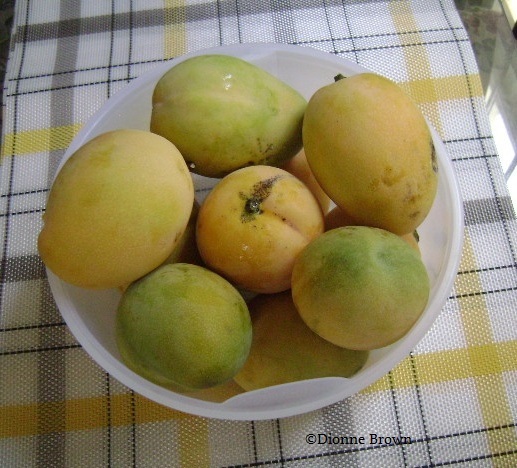 Yummy, yummy, yummy common mangoes. Before you eat one of these, make sure you have dental floss. Odorous cerasee tea meant it was time to pinch your nose, drink fast and hope the bitterness didn’t linger long at the back of your tongue or drive you to the toilet. A high, herbal rosemary scent was the signal your hair was about to be scrubbed and detangled. Well, these days, I must admit I can’t do without my cold rosemary rinse after a shampoo. Cerasee and sinkle bible, on the other hand, haven’t passed my lips since childhood. But you may find me sniffing eucalyptus oil during cold and allergy season to clear my nasal passages. And if I go to bed before my biscuit and warm milk digests, you may also see me reaching for ginger to brew tea for my sour stomach the next morning. 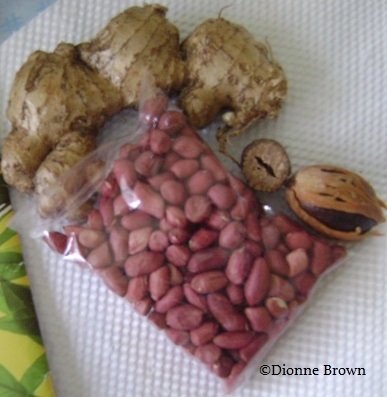 Jamaican ginger, peanut in skin and nutmeg (with and without mace). Natural curatives are what we swear by in Jamaica. Many Jamaicans will tell you that these God-given creations in their freshest state have worked well, time and time again. Natural remedies have always been “trendy” in our culture. We instinctively turn to them because their benefits were repeatedly demonstrated to us by our parents and grandparents. In today’s post, I thought I’d share (or remind us of) 11 of the many herbs, spices and other natural resources Jamaica is blessed with and a few ailments for which we typically use them. Now, a word of warning: I’m no medicine woman or herbalist; therefore, the information presented below doesn’t constitute any kind of prescription for any ailment you may have. So, a beg yuh do, research anything that is unfamiliar to you, and please consult a medical practitioner with any concerns. Second word of warning: most of the following is in patois. Ginger – used as a hot tea when di curry or roast pork siddung pon yuh stomach and won’t go down, or when yuh have bad feeling in yuh stomach, like after yuh come off a country bus, or have likkle morning sickness. Eucalyptus oil – used as a pre-shampoo when yuh scalp a scratch yuh or as a topical when yuh nose cork up or mosquito and ants bite yuh up. Mint leaf – used as a hot tea to press out gas, tek cold off yuh chest and help yuh food digest (like when di two beef patty and coco bread yuh eat fi lunch a ride yuh stomach and yuh cyan get no relief). Nutmeg – grated in warm milk to help yuh go a yuh bed. Cerasee – used as a tea to help ease belly pain, pass out worm and purify yuh blood and as a bath to tek off rashes and sores off yuh skin. Peanut trash (skin) – boiled as a tea to help build stamina. Rosemary – used in a cold rinse to mek yuh hair and skin feel nice and soft. Moringa – leaves had as tea and seeds eaten fi health and strength. Lemon leaf – used as a tea or bath when cold or flu de pon yuh. Sinkle (or single) bible – applied and then rinsed from yuh hair and skin to mek dem smooth and pretty and had as a drink to clean out di worm dem. Beach (yes, as in sand and sea) – salt water used to “sop” di joints or whole body to alleviate soreness, pain and cold and flu symptoms. Or if yuh nuh sick, but jus’ feel stress out, tek a dip, burrow yuh hands and feet in di sand and look out to the early morning horizon before sun hot. 1. A scandal bag refers to a black plastic bag with handles. 2. When a Jamaican tells you to “walk good”, it’s a blessing to keep safe as you travel home.